Questions in the section ‘electrostatics’ were discussed on many occasions earlier on this site. You may access them by clicking on the label ‘electrostatics’ below this post. Since the number of posts displayed per page is limited, you will have to use the ‘older posts’ button to access all the posts. All posts in this section can equally well be accessed by trying a search for ‘electrostatics’ using the search box provided on this page. (1) Point charges +q and –3q are arranged at points A and B on the x-axis (Fig.). At which point (or points) is the electric field due to this system of charges zero? (a) At two points on the x axis, one point to the right of the charge –3q and the other to the left of the charge +q. (b) Somewhere on the x axis to the left of the charge +q. (c) Somewhere on the x axis to the right of the charge –3q. (d) Somewhere on the x axis, in between the two charges. (e) The electric field cannot be zero anywhere. 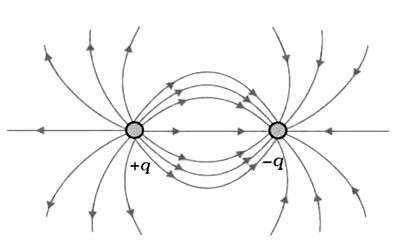 The electric field lines due to a positive charge proceed radially outwards (diverge) from the charge where as the electric field lines due to a negative charge proceed radially inwards (converge) to the charge. At points on the x-axis lying in between A and B the fields due to these charges are directed along the positive x-direction. Therefore, the fields add up and the resultant field cannot be zero. But at points on the x-axis to the left of the charge +q, the fields are in opposite directions (along the negative x-direction due to the charge +q and along the positive x-direction due to the charge –3q) so that they can cancel at a point where the magnitudes of the fields due to the charges are the same. So the correct option is (b). (2) A large flat plate is positively charged so that it has uniform surface charge density σ. If the electric field near the central region of the plate at a distance of 1 cm from the plate is 9 NC–1, what will be the electric field at a distance of 3 cm from the plate? The electric field due to the surface charge on the plate is normal to the surface of the plate. Since the plate is large, the electric field near the central region of the plate is uniform (with the electric field lines proceeding normal to the flat surface and therefore parallel). This means that the electric field at a point is independent of the distance of the point from the plate so that electric field at 3 cm from the plate is 9 NC–1 itself. 2EA = σA/ε0 where ε0 is the permittivity of free space. 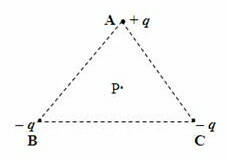 (3) Charges +q, –q and –q are placed at the vertices of an equilateral triangle ABC as indicated in the adjoining figure. What is the direction of the net electric field at the central point P? The direction of the electric fiel at P is the direction of the force acting on a test positive charge placed at P. The charge +q will exert a repulsive force on the test positive charge. This is irected along AP. The charges –q and –q at B and C will exert attractive forces along PB and PC respectively. These two forces being of equal magnitudes, their resultant will be directed along AP. 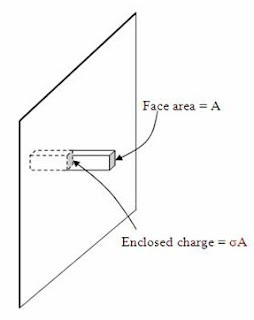 Therefore the resultant electric field due to all the three charges will be along AP [Option (a)]. (4) Points 1, 2 and 3 lie on the axis of an electric dipole AB. Point 4 lie on the equatorial line (perpendicular bisector of AB) of the dipole. Out of the following choices which one correctly gives the directions of the electric fields at the points 1, 2, 3 and 4? When you place a positive test charge at point (1) the net force on it is repulsive since the charge +q of the dipole is nearer than the charge –q. The direction of the force (and the electric field) is therefore leftwards. At point (2) the charge +q exerts a repulsive force on the positive test charge where as the charge –q exerts an attractive force on it. Thus both forces act rightwards an hence the electric field at point (2) acts rightwards. At point (3) the net force on the positive test charge is attractive since the charge –q of the dipole is nearer than the charge +q. The electric field at point (3) is therefore leftwards. At point (4) the positive test charge is repelled by the charge +q and attracted by the charge –q. these forces are equal in magnitude and are inclined equally upwards and downwards respectively. Their resultant acts rightwards and hence the electric field at point (4) is rightwards. The above facts are correctly given in option (e). 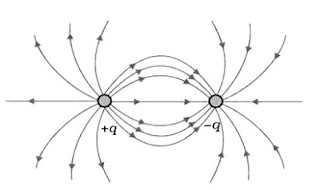 If you have a mental picture of the distribution of the electric field lines due to an electric dipole (See the figure below), you will be able to answer the above question in no time]. (5) In the above question, in the case of the points (1), (2), (3) and (4), where do you find zero electric potential? Points (2) and (4) are equidistant from the charges +q and –q. These equal and opposite charges produce positive and negative potentials of equal values so that they cancel each other, giving rise to zero potential at points (2) and (4).